American rapper. He said once "I'm 6'2". @Celebheights 6’1.5: he may be around your height but I doubt a full 6’2” either. It wouldn't surprise me If he wears lifts. Why does he look so much shorter than 6-1 a lot. Pics in which he has great posture. 6'1" is silly. He's taller than Obama in every photo. Really? I've seen several photos of the two in which Obama appears taller. Click Here 6ft at best in this video. 6'1.25 (186 cm) at most tbh..
@Rob why is he listed 6'1 in the mugshot??? Editor Rob: it either is going to be from the suspected criminal or the estimate of an officer. Since Jay Z already came out with 6ft 2, it's possibly the latter, though some people always inflate heights the more famous they become. I think that Obama is under 6'1 as Willem Alexander looked taller. 188 mornings to 186.5 evenings is plausible. I’d love to see Ricegum claim 6’3” with Jay Z. 186 downgrade should be thought about. As listed. In the big ones he's up there. I only had him by a deuce point 5. To tell you guys the truth, not a lot of people are taller than Barack Obama. Jay Z is an exception. His 6'2" claim is not all silly as he's only rounding up by half an inch. How anyone says Jay Z is 6ft flat is beyond me. He edges Obama out in every photo who is a legit 6'1. 187 is right for him. Not quite the full 6'2 but he has near an inch on Obama. I think he looks small in other photos because he has bad posture. how are some of you simpletons saying he is 5'11" or under 6 feet? or drake is 5'10"??? you do not deserve to have your comments on this site. Jay Z is without a doubt above 6'1"
He edged out Obama who is a legit 6'1"
He's certainly not under 186cm, as he edged out Obama. Great listing. He's 73.5 inches. Editor Rob: I think at times I could see how Jay Z looks shorter, even 184-5 range, but Is he really? His daughter is only 4 but she's already as tall as an 8 year old she'll probably be bigger than him when she grows up. Editor Rob: I don't know if the Future has any advantage (if the camera guy was closer to Future than Jay Z)...jay can at times look just 6ft 1, but then standing tall can look over it I feel. I really doubt he's even 6'1". If he's really 6'1.5" and look that short next to bill gates then he must be having some really horrible posture. He really doesn't look any taller than 6' to me. Those pictures with Obama are across the room from each other. You can't tell from that angle. Plus Jay Z was wearing Timbs while Obama is in dress shoes with a suit. It's okay. I'll take NFL combine measurements over estimates from pictures from Obama who we don't have an official measurement taken from other than what the white house says. All I know is when it comes to someone barely over 6'2 they always tower him. Geno Smith did the same and he is 6'2 3/8. Doesn't really bother me tho lol. I just stumbled on this site and I saw Jay-Z name and I was like "no way lol"
I saw a lot of the rappers you had on here were wrong like Drake, 2 Chainz, Wiz. If you need me to provide pictures just let me know. Editor Rob: sometimes photos don't reveal the real difference. With the NFL guy he can look short, with With Obama in one shot he can look tall. @5ft10 That's CJ Watson, who used to play for the Nets. He's 6'2" listed, measured 6'0.5" at the pre draft. Jay-Z may have a slight edge on him on that picture, hard to tell from the angle, but he's probably a solid 6'1" barefoot at worst. Jayz is about 6ft 1in tall. I've stood next to him & we're the same height. 5'11" is crazy talk. He look at least 6'1" most of the time. Why would a supposedly 6'2" man be listed at 6'1" in his mugshot profile?? They usually add up 1 inch. No chance this guy is over 6'1", he wears lifts, simple as that.There can two reasons for his 6'1" listing in mugshot profile- either he has a horrible posture which comes from his skinny fat physique or he wears lift which didn't wear in those days. Its always been obvious that A-rod is 6'1". I think Jeter is a bit taller. IMO I think Jay Z wears lifts. Didnt look taller than 5'11" with Geno Smith and also looked under 6'0" with Larry Johnson. Jay Z might even edge him out. The guy was also not destroyed Geno Smith when they stood up in even posture. There was no more than an inch between them (if that). He's also the same as Alex Rodriguez. The guy is taller than 6'1" Obama, and is the same height as Will Smith (who was every bit of 187 CM in person). Jay-Z is at least 187 CM. I think he definitely deserves a downgrade. 186 cm is safe enough for him. He is a lift wearer. When hes not wearing lifts hes 5'11. 6'2 Geno Smith destroys him. Here is Jay Z's mugshot profile. Just as CelebHeights said, he is mentioned 6'1 170 lbs. @Chulexico: Deron Williams was measured 6'1 and 3 quarters. Nah it's the camera angle I think. He is a couple of inches to three inches less than Prince William, another case of Americans adding shoe size to his height. Agree with all the 5'11" deductions. I saw him in person. I'm 5'10" and he was pretty close to my height with boots on. @188 CM Celebheights: You pegged Puffy at 186 cm based on just one pic. If you look at that picture, Diddy is standing closer to the camera.Plus, the camera is lower. Check out for one of the Rob's video on Youtube about mugshots and camera angles. It can produce a huge difference. By the way, Jay-z's mugshot profile has him listed as 6'1" 170. 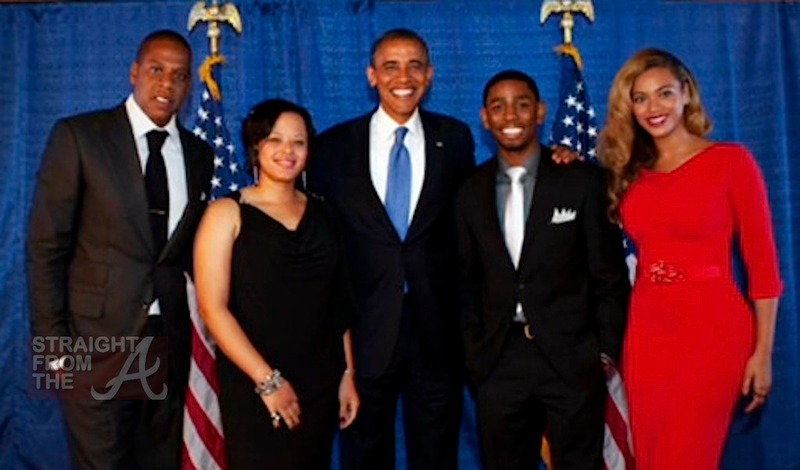 Deron has 0.5 inches on Jay Z, Jay Z should be 6'1.25"(186 cm), that seems to be suitable, he also looks 186 cm with Obama. I'm confused, there are plenty pics where he looks 6'2(especially with 6'1 measured Obama), then there are equal number of pics where he looks 5'11 range. MLB listing are always correct. No, they actually extremely inaccurate sometimes. They're not as consistently too high like NBA listings but they can be as bad or worse at times. A-Rod is shorter than Jeter who might not even be 6'3" himself. And he looks 6'0" tops in the Jordan pick. i agree with this listing! 6'1.5 (1,87 m) on the nose for him is a good estimate for Jay-Z. He always looked taller than Obama, who's a legit 6'1. Seahawksfan 187- 188: Dude, you're a complete idiot, if Jay z is coming up to Michael Jordan's eye level, he's easily 4 inches shorter. Jay Z ain't more than 6'0, end of the story. Must be without his Timbs with #23....I got Jordan by an inch and Jay Z by me didn't look that much shorter than a couple in Timbs. He been caught height sleepin' and #23 is leaning in. @Seahawksfan: Jay z is looking 4-5 inches shorter than Michael Jordan in that pic. Jay Z is about 5'11" or less we are about the same height. Saw him backstage awhile back. Here is the pic of jay z with Larry Johnson,you can even see their shoes, jay z isn't more than 6 feet. Jay is 5'11-6' flat, he's a lift wearer, Geno brutally destroys and even if jay z would be in a god posture, he could not have pulled anything over 5'11.5, plus he's also shorter than Larry Johnson, he doesn't tower Bill gates, who's a very weak 5'9 now. He probably over 6'2 with his thick super heels on, without them he's only 6 feet or even 5'11, he's a lift wearer just like Puff daddy. Jay is 6' flat, all those pics are with lifts. Let me know y'all one thing, Kobe Bryant is surprisingly equal to 6'3.5 Game, jay z is 184 max. Truly only in you dreams, Jeff. @ James Richardson: Drake is 5'9 barefoot and Jay Z is 5'11 barefoot. @Opium: Drake is 5'10, 6' is like a joke, and that puts Jay in 6'-6'1 range. rob is a full 6'2 possible?? he's got a better chance of being a legit 6'2 than will smith. "Jay Z height: 6ft 1.75in (187cm)"
@Jack, I think Seahawkfan is trying to be magnanimous. The point is that all of those ridiculous five-ten shots-in-the-dark are just that: ridiculous. @Seahawksfan identical? He clearly looks an inch taller if not more than him in that pic. I saw him in person. he is not taller than 5'11". Really unless you saw him in person you can't be arguing so passionately that he's taller against those of us who have seen him. Actually, sportsmen appear to or three inches taller than they are cuz while playing their spine decompresses, and at times they appear taller, that is why you see Geno Smith far taller than Jay Z.It happened with me in summer vacations, I was 5'8 and my bully brother said you look 6', seriously. yeah I heard that song but sometimes people can think your shorter then what you are by your body type or posture.You dont know how the 5ft7 claim came to be.You dont know if he was asked and he said "ehh 5ft7" or if it was assumed.People who are husky with a build like kanye look shorter but look at pharrell with Jayz look at the big difference in height does he really look only two inches taller then a 5ft9 man in dress shoes? Matt, how can he be 6'0-'6'1 when 6'0.4 measured Larry Johnson clearly as 1-2 inches on him. @5ft10 guy - I can agree with Nas somewhere around 5'8" but Kanye is 5'7". I'm not positive on Leo's height myself, I think 5'11.5" is pretty generous but it could be right. I just think that he's not over 5'11". I don't claim to know any of these heights for a fact, but I definitely do not believe Kanye is 5'8" if he's got 5'7" mentioned in his music. @matthew if Leo is 5ft10.5 why does Rob have him at 5ft11.5 and kanye at 5ft8 along with Nas.So either you're wrong or Rob has been been messing up alot.Jayz cant be 6ft-5ft11 as that isnt a tall height.I think you should make a choice 4) which is jay is a 6ft2-6ft1.75 guy who slouches and doesnt stand as tall as he can. @5ft10 guy -- I've always thought Leo Dicaprio is more 5'10.5" - 5'11" anyways. Jay Z could be between 6'0" and 6'1". But Geno Smith towered him. Oh and Kanye is 5'7" btw, just as stated in that song "American Boy". You really think a guy with Kanye's ego would downgrade himself an inch? He's 5'7" tops. Jay Z usually looks anywhere from 5'11" to 6'2" in photos, which either means 1) he's a 5'11" range guy who wears lifts and tries to look extra tall 2) he's around 6'0" - 6'1" tops or 3) he's a 6'1" - 6'2" guy who has a huge slouch. To me I think #2 is most likely. Why are you getting upset so much?Seems like you have something against the man.The geno smith picture isnt very good.So what Robinson Cano is 5ft9 hmph Ive been to yankee stadium and have seen Cano upclose and hes tallish.Jayz is also farther away from the camera.I really do think hes about 6ft2-6ft1.75.Alot of guys Rob puts at 6ft2 Jay looks taller then them.For example Graham McTavish doesnt look as tall as Jayz did next to Kanye West or say Nas both 5ft8 guys like Rob .When you say Jayz is 5ft10 thats just stupid.Jayz has been next to diddy (5ft10) females 5ft9(Skylar Diggins) and is still taller then him and her in monster heels!Here is Jayz with Leonardo Dicaprio Who's close to 6ft.Ofcourse Jayz is taller by how much I'll let you decide. Looks 6ft2 he just is. I'm 6'4.5, I've met Jay Z, he does'nt even look 6'1, top of his head was levelling my eyes, he would be 6' max. and 5'10 min. He's a ****ing liar, he was looking ****ed when he stood with Geno Smith. Jay is nowhere near 6'2. I use to see him at Rucker Park in 2003 around the time of the NYC blackout. He looked closer to 6'1. I expected Will Smith to be much taller than me also. i expected him to be taller. Jay said on his new album he's 6'2. He's at least 6 foot easily. He Always looked tall to me but not too tall. I'm usually around 186 cm but i think Jay looks much taller than me on pictures. But i was also totally suprised when i heard a classmate say hes 185 cm cause to me he looked very tall. i thought i was much shorter. can it be true that somebody of your own height looks taller to you in your own eyes when you look at them from a distance somehow? His height goes up and down like crazy. Just like LL Cool J.
Hes at MOST 5'11, imo. The pic with Larry Johnson is very good because hes wearing what looks to be pretty flat shoes. Maybe an inch? I wouldn't downgrade him by 3" based on that one pic, as he's looked much taller often enough. But 184 cm might be more plausible for Jay Z.
Sly stallone would be envious of his lifts. Johnson is in another pic where he looks about 2 inches taller. How can a supposed 6'1.5 guy look 5'10. The answer is he wears lifts. He cant be taller than 5'10.5 thats for sure. 6'2 Geno destroys him. He must be a lift wearer. He looks 5'10 with Geno Smith. I see 4 inches. He also looked under 6'0 with Larry Johnson as well. Jay is 5'10. And remember the Geno measurement is in the morning too. I don't know if lifts come in to play at all, but he CAN look his listed height or taller on occasion. That said, looking at other pics of him with Kobe Bryant, Lebron James, and Kanye West (who is 5'7", not 5'8" as listed here) I think 6'1.5" is VERY debatable for Jay Z. He can look 6'1" in one pic, and then be struggling mightily with 6'0" in the next. Cano isnt 6'0. Hes 5'10. Geno was measured at 6'2 3/8 exactly in the morning. Geno Smith measured 6'2 3/8" to be exact, which is 189 cm. Jay Z looks about 181 cm in that photo. If we assume that the difference in height is even half of what it appears to be in that photo Jay Z still only comes out at 185 cm. He could be 187 cm but I'd be leaning towards a 185 - 186 cm listing. rob, how tall would you say frank ocean is? 5'11, possibly a little taller? I saw Jay Z at 40/40 next to a 5'11" tall model at an event. He was wearing boots, she was wearing flats, and they were the same height. He can not be more than 6'0" or even 5'11". Might be 6ft2. Had 1in on Jonathan Ross whose 6ft1.5 claim is questionable. He shape-shifts, so his height can swing a fair bit. Based on his pic with Geno Smith, he needs a serious downgrade. Smith is 6'2 and it was verified during NFL combine. There is a solid 3 inch difference between them. Tells you that Jay Z wears lifts. Rob upgrade please 6ft2 no one ever really is taller then him. I used to think jay z was tall, but ive seen pics of him with snoop who is about 6.3/6.4 and he looks atleast 4 inches shorter. I dont think snoop would wear heel lifts, i believe jay-z would though, i reckon hes a 5 10 without his dressing shoes and 3 inch heels. Seems a legit 6'2 due to the obama pics. Obama is 6'1.5. 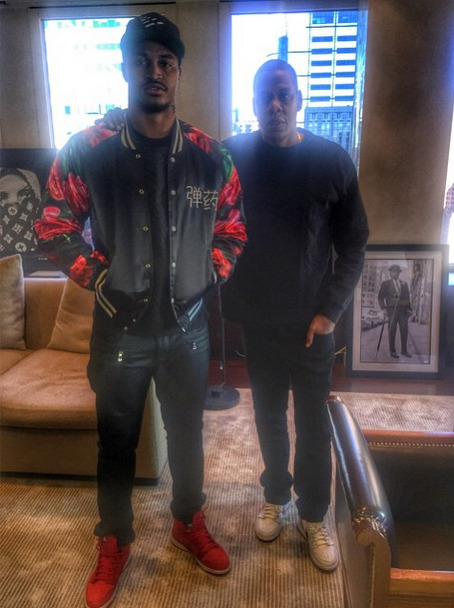 Will seemed taller than Jay Z in the photos shown. He was leaning back more than Jay Z and was still taller. He had boots on though while the shoes Jay Z had didn't add much to his height. Again, hardly taller than DiCaprio at the Gatsby premier. I believe 6'0.75 or 185 cm max is closer. I'd say there is more evidence that shows this rather than him being 6'1.5 or 6'2. 6'2 is ridiculous. He's under 6'1. The Deron Williams video proves that. Hes definately around 6'2 with a straight posture. He slouches a lot. NBA point guard Deron Williams is listed at 6'1.75 barefoot and 6'2.75 with sneakers on per Draftexpress. Here is a video of him and Jay Z talking, both with sneakers on. There is at LEAST a full inch between them. Here is jayZ with a picture of Heavy D(RIP) I wanted to post this a while back but I couldnt find it. He's not 6'0.5 thats too low.That picture with 50 you dont know what their standing on and the picture below it shows Jayz and Dr.Dre.And in that pic Jayz is much taller looking 6'3 in that pic so you cant go on headshot pics at least this one with Heavy D(6ft2.5)their legs are visible anyways. Jayz looks 6ft2 with Heavy D same height with Heavy being taller by a slim.Jayz posture have to be put into account too.Jay-z is 6ft2 Heavy D is 6ft2 but Rob put 6ft2.5 for D.
Jayz is never really towered by 6ft4 guys ever.A rapper like 2chainz(needs to be added) who's like 6ft4.5(this guy's height is recorded since he played basketball) range did'nt towers Jayz in their pic together. I think Rob should upgrade him 6ft2 is his real height...Legendary Rapper Legendary Height. As listed 1 foot from me at The Bellagio some years back. Wears Timbs most of the time. three inches taller then Justin Timberlake.With Justin hair advantage he looks two inches taller imo.So if Justin looks about 6ft something with the hair and Jay looks two inches taller then Jay is definately 6ft2. Both Men have the same shoes and similar posture. Jay-Z is a noted lift/Timberland wearer. That is the reason his height fluctuates so much/often. Jay is 6'0.5" tall. Trust me on this, as I've worked with him on several occasions. fmb your an idiot for thinking Jayz is 6'0 tall. He towers too many people to be that. Besides them not looking identical in height in that picture (Jeter is clearly taller), you do know that baseball height listings are just as often exaggerated as any other American sport, right? There are a not insigificant amount of little 5'7" and 5'8" guys running around on the field listed anywhere from 5'9" to 5'11". Jeter is probably 6'2.5" - 6'2.75" range. @MD Jeter has about 1inch-1.5 tops!Jayz isnt alot shorter then him at all. And you assumption that all athletes have their height boosted up is totally not true and silly.I dont think you notice Jayz neck isnt erect.Jeter's hair also increases his height.I look at the top of his hairline. Jeter's '6'3' listing is an "athlete height". I agree with Dsmooth. In pictures taken with 6'1.75 measured point guard Deron Williams, Jay-z looks at least .5 of an inch shorter. @MC: If he were 6'3", he wouldn't have claimed 6'2". He's as listed. Looks 6'1 MAX next to 6'2 Brooklyn Nets point guard Deron Williams. Actually, I've changed my mind on Jay-Z and Obama... Obama was measured at 6'1'' according to the medical document, but we do not know what time of day he was measured.... he could be 6'0'' if he was measured at 6'1'' in the morning. Looks 1in taller than Ross. Looks a legit 6'2, taller than Jonathan Ross looks to have a good 6 inches on Kanye West. Jayz was seen taking the train in nyc.Shame I missed it because I take the train alot . He was walking to the stadium and this guy obviously doesn't look 6'1.Compared to a big crowd Jayz looks 6'2 he holds his own against his bodyguards and that huge kid(6'5-6'6 dunno) to his left next to him.I really see only 4 people taller then him(including his 2 huge body guards)in a crowd of maybe 50 people or more. Thanks, man, never seen that before. I'd say Jay-Z is looking exactly the same height as Obama in the second pic considering that Obama isn't completely straightened up. Jay-Z looks taller in the first pic, but it's a weird angle. Rob you gotta change this he is an honest 6'2 with president obama 6'1 hes taller in alot of pictures. Yeah, but where's the evidence that Obama is 6'1''? Please rob he's 6'2 look at the top of both their heads. Click Here now Obama head is titled but Jay-z is still taller. Hes not a weak 6'2 hes 6'2 no more,no less. Jay-Z has the frame of an average man, which makes him look not tall at all. He looks 5'9'' when standing on his own because of his small frame. Does not give a tall impression in the slightest. 50 cent is not even 5'11 but we don't see their feet and the ground could be uneven. i think 6'1.5 is accurate for jay z and i never liked him. but yet on this picture, Jay is looking 2 inches taller than 50, how could that be? I think Jay-Z probably wears lifts on some occassions. He literally wants to be a larger than life rapper. I think his real height is 6'0.5 but I guess he wants to be 6'2 for some reason so wears thick footwear. I don't care if you Jay groupies wanna bash me for this one but the first 50 cent picture says it all. @cobra: Jay-Z's listing is correct. Will Smith is about 6'1" or maybe just a tad under. Jay Z is 6'1 flat not just because of Chris Martin's height difference but because Beyonce is really 5'5. I was looking at a picture with Jayz and Will together and Jayz looks slightly taller maybe 6'2? Someone said he is taller than obama and jonathon ross. He was taller than Jonathan Ross, I saw the episode where he wore those funny old man glasses. I thought he looked a full 6'2" . Saw him recently, and this is a wrong listing Rob. I'm 5'11.5" and we were practically the same height, so he isn't a shade over 6'0". He's never seen 6'1". applies to Will Smith and Jim Carrey. In my opinion, Will Smith is noting over 184-185 cm, Jay Z looked the same height. Google Jay Z and 6'1" Chris Martin of Coldplay. Many pics showing them about the same height, or Chris slightly taller, depending on the angle / posture. I stood next to him as a security guard at a Puff Daddy show 15 years ago. Similar shoe thickness. I'm about 6'4" and I was at least 3 inches taller. Someone said he is taller than obama and jonathon ross. Obama is 185cm n ross 187cm. Explain that? He is also much taller than kanye west who is 174cm. He appears to be an even 6'0". I don't know why he would try to upgrade his height, he falls within the ideal male height range. Then why was he towered by 192 cm Snoop Dog? He looked like 8-9 cm shorter than him. 187 is joke...He is 6 ft 0.5(184),no more. @ Jack how could he be 5-11 when hes taller than 6'0 Jonathan Ross? 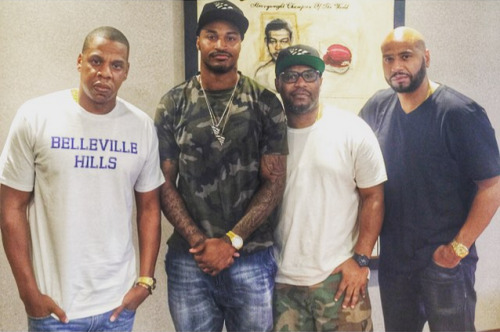 In the picture with Larry Johnson Jay Z is leaning over and is further back in the picture. He looks 5-11.5 with 6-0.4 Larry Johnson, so how can he 6-1.5? that bodyguard looks 6'7" cause beyonce reaches his shoulders and beyonce is 5'6". i still dont get why he looked so short next to Snoop Dogg, that's probably due to Snoop's frame... I have to admit that he can look 6'1.5! In my opinion he's in the 6ft1-6ft1.5 range! Not over 6'1.5 for sure! Stop saying he's 6ft2. That's not how a legit 6ft2 guy looks! Shaun his bodyguard looks 6'11 1/2. Same height as big show. GIANT!!!!!!! he never looks over 6ft with Kanye West. As i said he looks 6'2 with johnathan ross. yeah i think 6'1.75 is fair. he did look taller than jonathan ross. i guess snoop is also under 6'0 lol. James i'm not saying he cant be 187 but im saying that he looks much shorter than snoop dogg in every picture you find on the net! 5 cms is not that big difference! not the best camera angle in your pic Andrea. 6'0.5? How tall does that make Jonathan Ross 5'11.25? LOL. snoop is leaning, with leaned head... ok, he's closer to the camera, but he looks close to 5 inches taller! ok he's not that taller but there are at least 8 cms between them! search on google and you'll find other pictures of them! there's no one where there's only 5 cms of difference! in my opinion jay-z is a strong 6'0.5! no more! Terrible camera angle with will smith so its hard to gauge. All I will say is that he did look taller than Jonthan ross who is not under 6'1. You will see jay z is 1.5inches taller then smith. In some photos jay z and smith are the same height and in some jay z is an inch or so taller. Jay z is around 6'1-6'2 in height, around 6'1.5 and the funny thing is so will is listed at that height. Clearly jay z is the taller man. 6-2 is hilarious because Will Smith and Jay never look like legit guys both are 6-1 at best guys. Surely you mean 6'2 at best guys? He was shorter than a 6'1 guy in Vipers pics. 6'2 is not hilarious cause will smith is at least 6'1 and both him and jay look very similar in height.